Ford trotted out the Mustang in Germany and let auto writers take it to the autobahn. 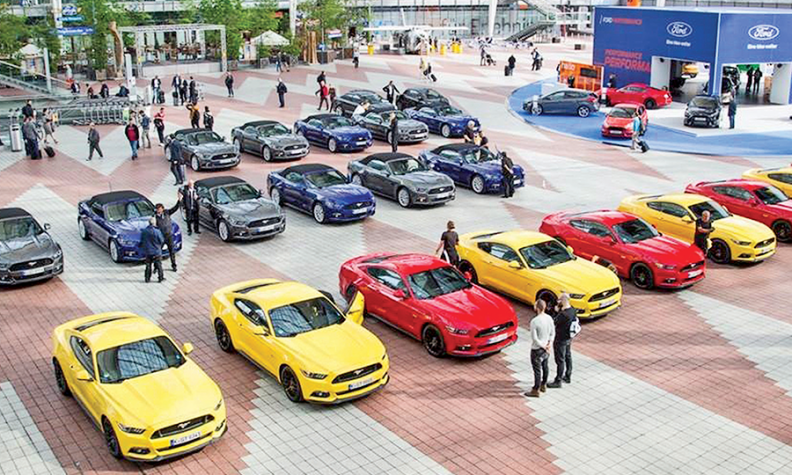 Ford last week began introducing the latest generation of the Mustang to European auto writers. The location: Germany. The first media to set foot in the iconic American sports coupe were jurors who vote for European Car of the Year. One of the venues Ford chose to let writers wring out the Mustang was an unrestricted stretch of the autobahn near Munich. The weather wasn't the best, said Jay Ward, director of Ford of Europe's communication and public affairs. Still, the Mustang proved it belongs on the high-speed venue. "The fastest I've heard is 230 kph (142 mph)," said Ward. "As the weather gets better, I suspect we'll get people going quicker." Ford is offering two models of the Mustang in Europe, convertible and hardtop, and two engines, a V-8 in the GT and a turbo four-cylinder.